At least 27,352 people in Osun State have benefited from a combined scheme sponsored by the state government and the Central Bank of Nigeria (CBN) tagged Micro, Small and Medium Enterprises Development Fund (CBN-MSME Development Fund) Our Osun State Correspondent reports. 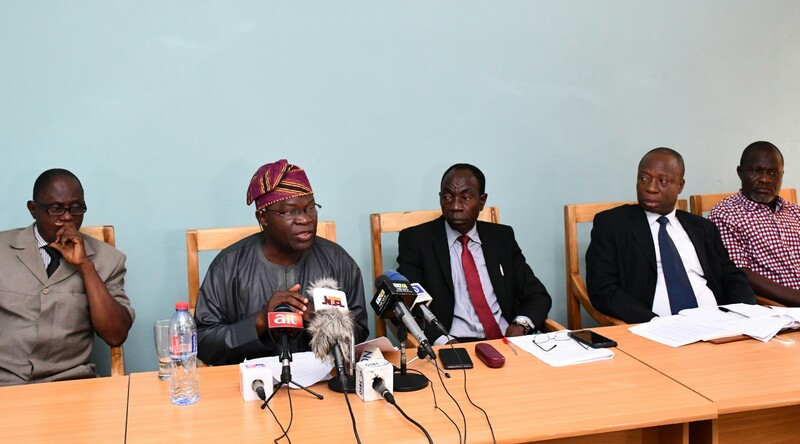 The Osun State Commissioner for Commerce, Industries and Cooperatives, Honourable Ismaila Adekunle Jayeoba-Alagbada disclosed this at a press conference in Osogbo, the state capital. Jayeoba-Alagbada disclosed that ?the state government focused on SME in order to keep this vital segment of the economy in active operation for the purposes of growing into a formal sector. ?The Commissioner stated that the Aregbesola's government provided the initial sum of N100 million disbursable fund while the CBN added N2 billion. According to the statistics indicating beneficiaries and the sum allocated, commerce and agriculture took the lion share of the disbursement ?as follows; Commerce has 12,531 beneficiaries with N2 billion disbursed while ?Agriculture disbursed N1.58 billion to 9,796 beneficiaries. Other sectors include: Manufacturing?? which shared N472 million to 2,661 beneficiaries; 1,886 Artisans also received N472 million; 248 beneficiaries in the education sector got N53.57 million to 248 beneficiaries? ; Health: N59.72 million to 223 beneficiaries; while Hotel and Hospitality got N7.29 million distributed to seven beneficiaries respectively. Jayeoba-Alagbada itemized few programmes focused with the intervention fund to include: Quick Impact Intervention Programme ? (QIIP) in agriculture; Cocoyam Off-taker Empowerment; Textile Dealers Empowerment, Transporter Empowerment and Cooperative Sector Restructuring and Growth. ?Scoring the Aregbesola's administration high across sectors, the Commissioner rated the present administration as the best in the history of the state in view of monumental achievements in the areas of commerce, industries, cooperatives and the promotion of Small and Medium Enterprises. The Commissioner described the landmark achievements of the administration as a watershed in the history of the state, saying in the spate of eight years, the state has witnessed monumental, visible and enduring achievements in every sector of the state's economy. "The thrust of our programmes is to ensure that financial services that are provided reach the poor but economically active women, support building financially self-sufficient institutions and ensure a positive and measurable impact on the lives of beneficiaries and their households. "Various successful interventions of the administration in agriculture, education, health, job creation, peaceful communal co-existence, poverty banishment, to mention a few, have impacted positively and powerfully on the socio-economic transformation of the State. "?A total sum of N851.7 million had been disbursed from the inception of the programme in 2011 to date. 496 farmers’ cooperative groups with a combined membership of 11,460 had benefitted. This is made up of 19 per cent men, 36 per cent women and 45 per cent youths. "The sterling performance of Osun Micro-credit Agency has been recognized by the CBN as the apex bank adjudged the agency as the best in Nigeria in the management of CBN-MSME Development Fund. "There is no doubt that the Aregbesola administration has laid a solid foundation and has gone ahead to put firm super structure on the foundation to ensure an enduring socio-economic development of the State. "The administration is bequeathing a legacy of unparalleled commitment to rapid transformation of the State of Osun to succeeding administrations", Jayeoba-Alagbada said.